Everyone loves the T300 air purifier - it looks cool, is affordable and has the purification power of a HEPA air filter. The T300 air purifier is ideal for a smaller room up to 300 ft. The T300 air purifier is our very own tower of power; it has HEPA air filtration, an ozone-safe ionizer, an ultraviolet light and an activated carbon filter. The HEPA filter in the T300 air purifier eliminates pesky allergens like pollen, mold spores, dust and pet dander while the UV light sterilizes any rogue bacteria and viruses. The T300 air purifier also has an ozone-safe ionizer that has been proven to promote a healthy environment. The built in activated carbon filter in the T300 air purifier eliminates odor. You may have seen advertisements or seen in stores similar in appearance tower air purifiers ? these are ionic air purifiers that use ozone producing ionizers to charge particles and collect them on metal plates. The ozone-safe T300 air purifier has tested 1,000% better than these ionic air purifiers. 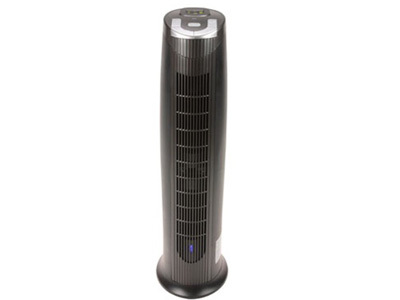 Similar sleek design but the T300 air purifier is oh so much better for you, your air quality and the environment! The T300 air purifier has a Pre-filter/HEPA Air Filter tested to remove 93% of airborne contaminants in rooms up to 300 sq. ft.
Unit Size: 11" x 9" x 28"